Boat Hybrid Hybrid Wash & Wax is a premium wash and gloss-enhancer for boats, watercraft, trailers, and more. Boat Hybrid Wash & Wax easily washes away the heaviest marine contamination like salt spray, bird droppings, dirt, grease, marine oil, diesel fuel, dirt, and grime. 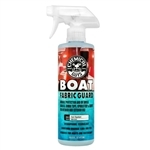 Boat Fabric & Vinyl Cleaner is designed to remove dirt, stains, and mildew from marine fabric and vinyl surfaces. The sprayable cleaner quickly eliminates stains to restore vinyl and fabric back to original condition. 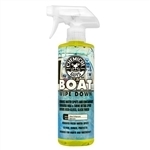 Boat Wipe Down Water Spot Remover Detail Spray is the perfect detail spray to clean up after a day out on the water. Water, salt spray, bird droppings, and pollution can bring down the look of any boat or vessel. Chemical Guys Boat Polish & Sealant is a one-step product for fast scratch and defect removal with durable protection for boats and watercraft. The advanced abrasives in Boat Polish & Sealant start strong to quickly cut down deep scratches and defects, then break down into a fine polish to restore luster and shine to gel coat, fiberglass, and plastic surfaces. Boat Revive Polish removes surface defects and refines the finish to a deep lustrous shine. The special abrasives start off strong to cut away oxidation and defects, then refines lightly to restore gloss and deep reflection. 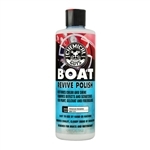 Use Boat Revive Polish on fiberglass, gel coat, paintwork.